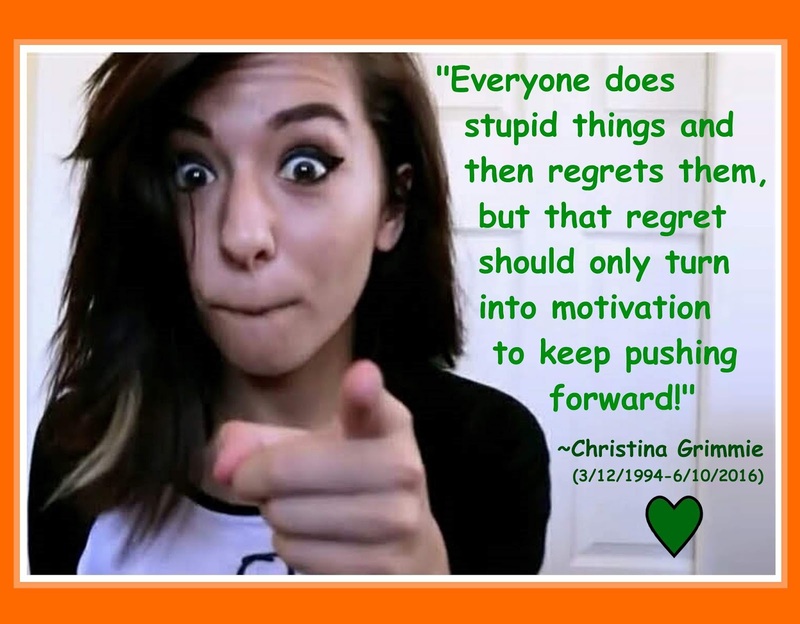 Never Give Up: Christina Grimmie: "Keep Moving Forward!" "Team Grimmie, you guys Rawk!" On_September 18, 2014, Christina Grimmie made a video on her YouTube channel answering questions from frands submitted through Facebook and Twitter. She was in the midst of a huge period in her career, and there weren't as many "Grimmie Thursday" cover videos as before. But she didn't distance herself from Team Grimmie; on the contrary, even as her circle of frands grew larger, Christina found new ways to use social media to share herself as an artist and a person. On this video, what we encounter is four minutes of "Christina being Christina" (even though there is some editing). Fame and recognition from her magnificent run on Season 6 of The Voice did not go to her head. She remained her inimitable self, encouraging, kind, ever-wise, full of common sense, goofy, and hilarious (and so she continued to the very end). Watch the whole video now if you wish. It's not particularly "extraordinary" in comparison to her other videos. But I just happened to watch it recently, so I'm using it as the basis for a few reflections. Like I said, it's Christina being herself. Her current single at the time, "Must Be Love," gets a plug near the end (not one of my favorites of hers --the one and only song she released with Island Records) but then she pops in again after that. There are some special things here: she gets a request to sing "anything" and so she sings... impromptu, no gadgets, no singing mike... and it just shows again, however briefly, that the beauty, versatility, pitch, and tone of her voice are all totally her own. It's a fact that I never get tired of being amazed by. And it's a video "from home," no frills. People who don't know Christina might just think, "Oh, she's just promoting her new single." Of course, promoting makes sense (even though most folks watching this video were already going to buy it). But that's not the main point. Actually, do you know what I love especially about this video? There it is, behind her shoulder, jutting half way out, just sitting there. Just like it would be "in real life." Because this was a piece of "real life." It's a sign of openness, I think. She didn't worry about "the set." She just opened up her own environment and shared it. Christina's videos are endearing because of the "stuff in the background," which is just her stuff, pieces of her life. Starting from 2009 with "Sonic the Hedgehog." Sometimes on the livestream, she would eat popcorn or some other snack. She came at you from right out of her own life. While she did plenty of posting on short video venues (Vine, Snapchat, Instagram), YouTube and the livestreaming YouNow allowed her to "hang out" with people at greater length. The archives of these videos are more than precious relics of the past. She still communicates through them, just as she does with her music. People read books by writers who lived hundreds of years ago, and they say, "This book had an impact on my life!" A communication from the past reaches a person and touches his or her life in the present. I believe that Christina's videos also communicate in this way. It's not just the spectacular singing. It's the simple, humble, ordinary things: her way of carrying herself, her joy, her almost "authoritative" confidence when speaking about life or encouraging people, her genuineness, her sense of humor. And this communication remains available to us. We can still learn new things from her about being human. Indeed, she has much to teach us. I do lots of research on communications media and their impact on the psychological environment of human persons. I watch lots of videos and other media posts, and it's common to find them generating a stressful, superficial, cynical, rude, and bullying environment of negativity. Even with a researcher's "distance," I can get worn down by these kinds of media presentations. When I need to just "clear my mind" a bit, find some human space, some "mental fresh air," I go watch some Christina Grimmie videos. She always comes through. She is a real human being, giving herself and her art. She is loving. It's an environment of love and encouragement that she generates. And I believe that her real, individual person lives, now -- taken up into the mystery of God, yes...the God who is Infinite Mystery, and also the God who has revealed Himself as Infinite Goodness and Love. We might dare to think that she is aware of us now (in God, who is without limitations), that she cares, that these gestures of love "from the past" are still given, even renewed, by her, so that we can know the touch of God's love, and continue to move forward enriched by the gift of her life and of the person she is, now, loving us from God's heart.